« How does time go by so quickly? 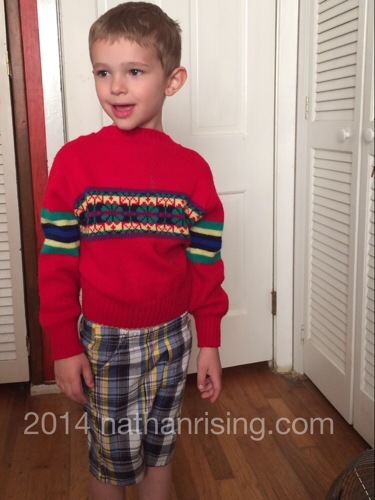 Nathan likes to pick out his own clothes and get himself dressed and ready for school in the mornings. Sometimes he’ll wake up before the rest of us do, and he’ll come marching into our room completely dressed complete with his shoes and backpack on, ready to go. He always does really well picking out clothes according to the weather forecast. He likes to check the weather with me the night before, and we’ll discuss the predicted temperature high for the next day. He’s also really good at matching his clothes. It’s pretty rare that I have to ask him to change into something more weather-appropriate. The forecasted for that day was going to be in the 80’s. Not only did he pick out a sweater, but he had it on backwards and it totally clashed with his shorts which were haphazardly twisted the wrong way around his waist. Bless him for trying!! My precious boy. How I love him! This entry was posted by Jen on May 28, 2014 at 2:03 pm, and is filed under All About Nathan. Follow any responses to this post through RSS 2.0.You can skip to the end and leave a response. Pinging is currently not allowed.